Completing your education should be a dream come true as you head out into the real world to find employment and begin your real life. But for students with private education loans, it can be a nightmare. We at ConsumerAffairs hear regularly from folks caught up in what seems like a never-ending maze of dealing with the process. 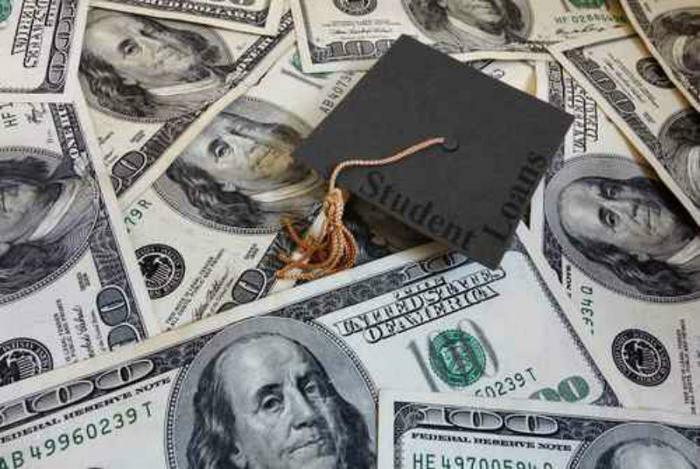 Now, the Consumer Financial Protection Bureau (CFPB) Student Loan Ombudsman has released a report analyzing complaints the bureau has received from private student loan borrowers. It shows these loan borrowers face payment processing pitfalls that can lead to increased costs, prolonged repayments, and harm to their credit profiles. The CFPB is also issuing a consumer advisory to help certain borrowers communicate their payment preferences to servicers, so they can take better control of their student loans. In recent years, many consumers have borrowed significantly to pay for postsecondary education. Before the financial meltdown, the private student loan market boomed. Today, while the private student loan market has declined after the bust, many borrowers are still struggling to pay back their loans. According to a recent CFPB analysis, for borrowers graduating at the time of the financial meltdown with more than $40,000 in student debt, 81% used private loans. Unlike federal student loans, these private student loans generally have higher and variable interest rates and may not allow borrowers to easily manage their payments in times of hardship. Prepayment Stumbling Blocks: Since options to refinance high-rate private student loans are limited, many consumers attempt to pay off their loans in order to reduce the amount of interest owed over the life of the loan. But many of them express confusion about how to pay off their loans early. For example, borrowers complained that payments in excess of the amount due are applied across all their loans, not the highest-interest rate loan that they would prefer to pay off first. Partial Payment Snags: When borrowers have multiple loans with one servicer and are unable to pay their bill in full, many servicers instruct borrowers to make whatever payment they can afford. Many complaints described how servicers often divide up the partial payment and apply it evenly across all of the loans in their account. This maximizes the late fees charged to the consumer and it can exacerbate the negative credit impact of a single late payment. Servicing Transfer Surprises: When borrowers’ loans are transferred between servicers, borrowers say they experience lost paperwork, processing errors that result in late fees, and interruptions of routine communication, such as billing statements. Consumers complained that payment-processing policies can vary depending on the servicer. And, consumers said when they make decisions on the previous servicer’s practices, they can get penalized. The CFPB has put out a consumer advisory to help borrowers instruct servicers on how to process their payments. If a borrower has several loans with the same loan servicer and does not provide instructions on how to process the money sent in each month, the servicer generally decides how to allocate the payments. Leaving this decision up to the servicer is not always in the consumer’s best interest. The new advisory includes sample instructions to a servicer telling it to always direct any extra payments toward the highest-rate loan, saving consumers the most money. Discover Bank and its affiliates are under fire from the Consumer Financial Protection Bureau (CFPB) for illegal private student loan servicing practices. According to the agency, Discover overstated the minimum amounts due on billing statements and denied consumers information they needed to obtain federal income tax benefits. The company also engaged in illegal debt collection tactics, including calling consumers early in the morning and late at night. The CFPB’s order requires Discover to refund $16 million to consumers, pay a $2.5 million penalty, and improve its billing, student loan interest reporting, and collection practices. Discover Bank's student loan affiliates -- The Student Loan Corporation and Discover Products, Inc. -- are also charged in this action. Beginning in 2010, Discover expanded its private student loan portfolio by acquiring more than 800,000 accounts from Citibank. As a loan servicer, Discover is responsible for providing basic services to borrowers, including accurate periodic account statements, supplying year-end tax information, and contacting borrowers regarding overdue amounts. Student loans make up the nation’s second largest consumer debt market. Today there are more than 40 million federal and private student loan borrowers and collectively these consumers owe more than $1.2 trillion. The market is now facing an increasing number of borrowers who are struggling to stay current on their loans. Earlier this year, the CFPB revealed that more than 8 million borrowers were in default on more than $110 billion in student loans, a problem that may be driven by breakdowns in student loan servicing. While private student loans are a small portion of the overall market, they are generally used by borrowers with high levels of debt who also have federal loans. According to CFPB, thousands of consumers encountered problems as soon as their loans became due and Discover gave them account statements that overstated their minimum payment. Discover denied consumers information that they would have needed to obtain tax benefits and called consumers’ mobile phones at inappropriate times to contact them about their debts. Provide account credits of $92 to consumers subjected to more than 5 but fewer than 25 out-of-time collection calls and account credits of $142 to consumers subjected to more than 25 calls. About 5,000 victims will receive these credits. Student loans have become the nation's second largest consumer debt market and, in a weak job market, there has been a rapid rise in borrower delinquency in recent years. The Consumer Financial Protection Bureau (CFPB) is bringing new oversight to nonbank student loan serviers, issuing new rules intended to protect borrowers from unscrupulous lenders. More than 40 million Americans with student debt depend on student loan servicers to serve as their primary point of contact about their loans. Student loan servicers’ duties typically include managing borrowers’ accounts, processing monthly payments, and communicating directly with borrowers. 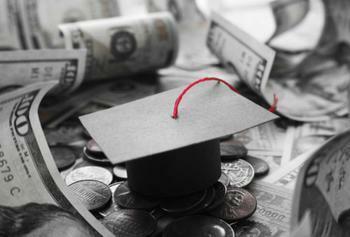 Earlier this year, the CFPB announced that outstanding student debt totals approximately $1.2 trillion. The Bureau also estimates that 7 million student loan borrowers are now in default on their debt. When facing unemployment or other financial hardship, borrowers contact student loan servicers in order to enroll in alternative repayment plans, obtain deferments or forbearances, or request a modification of loan terms. A servicer is often different than the lender itself, and a borrower typically has no control or choice over which company services a loan. When problems arise because of servicing concerns, student loan borrowers may end up in trouble. They may miss a payment, owe more money because of additional interest on principal, or face future difficulties with credit because of a poor payment history. The Bureau currently oversees student loan servicing at the largest banks. Today’s rule expands that supervision to any nonbank student loan servicer that handles more than one million borrower accounts, regardless of whether they service federal or private loans. Under the rule, those servicers will be considered “larger participants,” and the Bureau may oversee their activity to ensure they are complying with federal consumer financial laws. Under today’s final rule, which was proposed in March, the Bureau estimates that it will have authority to supervise the seven largest student loan servicers. Combined, those seven service the loans of more than 49 million borrower accounts, representing most of the activity in the student loan servicing market. Prepayment Stumbling Blocks: Since options to refinance high-rate private student loans are limited, many consumers attempt to pay off their loans in order to reduce the amount of interest owed over the life of the loan. But many consumers express confusion about how to pay off their loans early. For example, borrowers complained that servicers applied their payments in excess of the amount due across all their loans, not to the highest-interest rate loan that they would prefer to pay off first. Partial Payment Snags: When borrowers have multiple loans with one servicer and are unable to pay their bill in full, many servicers instruct borrowers to make whatever payment they can afford. Many complaints described how servicers often divide up the partial payment and apply it evenly across all of the loans in their account. This maximizes the late fees charged to the consumer, and it can exacerbate the negative credit impact of a single late payment. Are student loans the next financial crisis? The genesis of the 2008 financial crisis is pretty clear. Mortgage companies eagerly made loans to homeowners without thoroughly checking whether they could really afford the payments. When over-extended consumers began to default in large numbers it sent a devastating shock wave through the international financial industry, which had purchased trillions of dollars worth of these mortgages in the form of securities. The housing market has begun to finally recover but the economy is still feeling the effects of this meltdown. Some economists are worried the same thing could happen with student loans, with equally-devastating results. Consider the numbers: in 2012 the Consumer Financial Protection Bureau (CFPB) reported total student loan debt in the U.S. had passed the $1 trillion mark – it's now surpassed $1.2 trillion. The CFPB expressed the concern this level of debt might not be manageable in a tight job market where debt-burdened graduates have difficulty finding employment. After mortgages, student loan debt, from both federal and private loans, now represents the biggest aggregate debt balance. 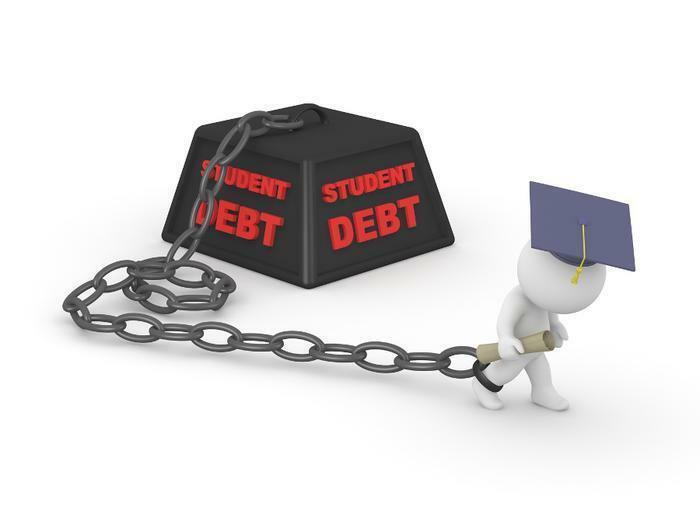 A 2013 report by the Congressional Joint Economic Committee showed the steady increase in student loan debt over the last decade has been driven by an increase in both the number of student borrowers and the average debt of those borrowers. Two-thirds of recent graduates have student loan debt, the report found. Those borrowers had an average balance of $27,200, which is 60% of the annualized average weekly earnings of young college graduates. In other words, they have little money to pay for rent, much less a mortgage. While cash-strapped youth are a drag on the economy an equal concern is whether they can pay back the money they owe. On that score there's plenty to worry about. Federal data shows that more than 600,000 federal student loan borrowers who began a repayment program in 2010 had defaulted on their loans by 2012. Nearly half – 46% – of those students attended for-profit institutions. The latest default figures, released last September, show a rise in the default rate for the sixth straight year. While investment banks and hedge funds rushed in to purchase mortgage back securities during the heyday of the housing bubble, they aren't the ones holding student debt. At least not as much as they were. JP Morgan Chase announced in October it was get getting out of the student loan business altogether. Instead, it's largely the U.S. taxpayer that's on the hook. Over the last year or so the U.S. government has been buying up student loans, with the objective of encouraging lenders to stay in the student loan market. If the loans eventually go bad, it probably won't trigger a financial meltdown like the foreclosure tsunami did. Rather, many economists fret on the economic drag caused by millions of young consumers – those lucky enough to find full time jobs – unable to buy a home or new car, spending their earnings to stimulate the economy. It is often said that co-signing someone's loan is risky business. It makes you equally liable for the repayment of the loan, and if the borrower defaults, the lender then looks to you for repayment. But there is also a case in which having someone co-sign for you can be a risk to you. This risk is highlighted in a new report from the Consumer Financial Protection Bureau (CFPB) Student Loan Ombudsman. Let's suppose you need a co-signer in order to get a private student loan. Maybe a grandparent volunteers. You receive the loan and start making payments. But then your co-signer dies. Many private college lenders have a provision in their loan documents that allows them to demand full repayment if the co-signer dies, even if the borrower is making on-time payments. It's called auto-default. And it doesn't take a death to trigger an auto-default. If the co-signer declares bankruptcy, many private college lenders reserve the right to immediately call the loan, regardless of the payment history. How often does this happen? The report cites no specific numbers, saying only that since accepting complaints about student loans, this issue has emerged. The Ombudsman's report says it is based on more than 2,300 private loan complaints and more than 1,300 debt collection complaints. 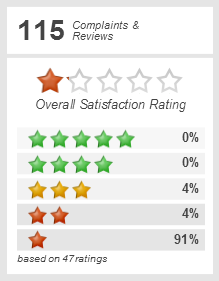 It doesn't mention how many of those complaints come from co-signers themselves, but chances are many of them did. A number of private student loan co-signers have posted complaints on the pages of ConsumerAffairs, usually for the touchy issues routinely associated with taking responsibility for someone else's debt. Dave, of Alameda, Calif., recently told us that Citibank does not give the co-signer much information about the loan. One way young borrowers can avoid this auto-default is removing their co-signer from the loan. However, the Ombudsman's report says that can be very difficult to do under the terms of the loan and that being allowed to release a co-signer from the loan is a frustrating process. The report cites an example in which a student was told his co-signer would be released after he made 28 on-time payments. But after the 28th payment he was told the number was now 36. After the the 36th payment, he was told the magic number was now 48. There is a distinction here and it has to do with the difference between a federal student loan and one from a private lender. According to CFPB, a federal lender only rarely requires the borrower to have a co-signer, but the loan is not called if the co-signer dies or declares bankruptcy. It is only some private student loan lenders that have this policy but it's not clear how you might know this, unless you ask. A better course of action might be to bypass private lenders altogether, something recommended by the Center for Responsible Lending (CRL). In fact, CLR has proposed the CFPB require colleges to ensure that students have taken advantage of all the federal loans they are eligible for before allowing them to do business with a private lender. “Federal loans are almost always preferable to federal loans because of more favorable repayment and forgiveness options,” the group says. The Democratically-controlled U.S. Senate has turned aside a proposal by fellow Democrat Sen. Elizabeth Warren's that would have allowed consumers with high-interest student loans to refinance them at today's lower rates. The reason? The measure needed 60 votes to move forward and the balloting broke cleanly along party lines, with Republicans opposing the measure. President Obama, who this week signed an executive order capping payments on government student loans, had voiced support for the Massachusetts Democrat's bill. It didn't matter – it failed on a vote of 56-38, 4 short of what it needed. The key stumbling block, most agree, is the way Warren proposed to pay for the measure. Since there is a cost to the government in lost interest revenue in allowing high-interest student loans to be renegotiated, there has to be an offsetting source of revenue. Warren proposed implementing the so-called “Buffet Rule,” a minimum tax to be applied to high-income taxpayers. That's a non-starter for Republicans. That prompted Jon Healey, editorial writer for the Los Angeles Times, to speculate Warren included that provision as a poison pill, knowing it would cause GOP senators to vote against the measure. “You have to wonder whether Warren sees student loan debt as a problem to be solved or a campaign issue to be seized,” he writes. That was certainly the take offered up by the GOP leadership in the wake of the vote. 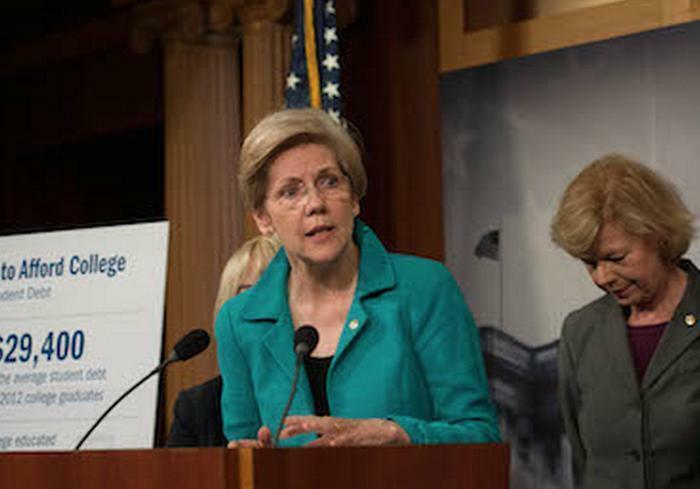 Warren, meanwhile, dismissed those claims and vowed to keep pushing for ways to allow graduates to relieve some of the pressure of their student loan debt. Warren says the legislation, which she introduced in May, would allow many of the 40 million borrowers with student loan debt to refinance. Similar legislation has been introduced in the GOP-controlled House of Representatives, where no action is expected. In her speech introducing the proposal, Warren called student loan debt “an emergency” and said it threatens the stability of the U.S. economy. Total student loan debt is now estimated at $1.2 trillion. The Congressional Budget Office (CBO) estimates that about half of the outstanding loan volume for federal student loans and loan guarantees – some $460 billion -- would be refinanced under the bill. Because of the lower interest rates on the refinanced loans, the CBO says the federal government would receive less interest income over the life of the new loans, which would make those loans and loan guarantees more costly for the federal government. So to pay for the refinancing plan, CBO estimates Congress would increase direct spending for federal loans that are currently outstanding by $55.6 billion in 2015. In the last decade more people have sought a college education and paid more for it. Tuition costs have skyrocketed and so has the amount of money students owe for college loans. Mark Cuban, billionaire investor and entrepreneur, says rising student loan debt is crushing the U.S. economy, preventing recent graduates from buying the things that normally stimulate the economy. Cuban has offered a rather simple fix. In an interview with CNBC this week, Cuban called for a cap on the amount of federally-guaranteed student loan money any individual can borrow in a year. With a loan cap, he argues, colleges will have no choice but to reduce tuition. His comments this week were, in fact, a repeat of those made over the summer at a business conference sponsored by Inc. Magazine. Cuban's comments reflect many of the same views we uncovered when we reported on skyrocketing college costs back in 2007. At the time, economist Joel Naroff, of Naroff Economic Advisors, pointed to an educational arms race, with elite private schools pushing the tuition enveloping and public universities scrambling to catch up. "There is very little pressure of any kind to keep costs down at private schools," Naroff told ConsumerAffairs at the time. "For most of the private schools, especially the better and elite schools, the more expensive it is, the more elite it is, and the more having a degree from that school is a perceived value." Cuban is now saying that the U.S. government can end this arms race – and perhaps help the U.S. economy – by reducing the money flow to higher education. He suggests limiting the amount of student loan debt to $10,000 per student per year. The current system, he argues, has created an “easy money” mentality among college administrators, who don't always use the money wisely, or in ways that benefit the economy. He uses the example of a college “building a better fitness center” to attract students. Because there is plenty of money coming in – through higher tuition paid for with student loans – spending just increases, and so does tuition, in a classic inflationary spiral. “Anytime you create easy money, you're gonna create a bubble or inflation and that's what's happening with college tuition,” Cuban said. Cuban isn't the only one worried about surging college loan balances, though not everyone may agree with his prescription. The Consumer Financial Protection Bureau (CFPB) first raised the alarm when student loan balances went over the $1 trillion mark in 2013. The total has only risen since then and is currently north of $1.2 trillion. CFPB has launched a “Know Before You Owe” program to educated students about the dangers of too much student loan debt before they take it on. You wouldn't agree to buy a new car without knowing what it was going to cost to drive it off the lot. Yet when it comes to selecting a college, many students enroll without knowing what a degree will ultimately cost. It's no surprise that millions of students end their 4 years with delayed sticker shock and thousands of dollars in student loans. Fortunately, colleges in recent years have become more transparent when it comes to letting prospective students know how much their education will cost. But it took a little prodding from the federal government. In 2011 the Consumer Financial Protection Bureau (CFPB) introduced its “Know Before You Owe” campaign for student loans. In a joint venture with the U.S. Department of Education, the CFPB produced a financial aid shopping sheet for use by colleges to help prospective students better understand the financial aid they might qualify for. Students can also use it to compare aid packages offered by different schools. 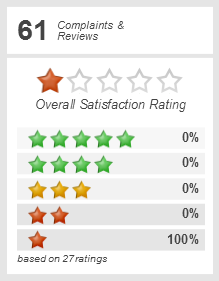 By April 2014, thousands of schools were using it. The Department of Education has an online tool to help students select a college or university based on cost. Using the tool a student can generate a report on the highest and lowest cost per academic year, focusing either on tuition or net costs. Tuition reports include tuition and required fees. Net price is cost of attendance minus grant and scholarship aid. Data are reported by institutions and are for full-time beginning students. The tool will also select the schools whose costs are rising at the fastest rate. That can be important if a student is a year or two away from enrolling. It lets them know that costs might be higher when they actually enroll and go up significantly over the 4 years they are in school. Individual colleges are also now required to provide online tools that increase cost transparency. Wellesley College has a cost estimator called My inTuition. The tool asks just 6 basic questions before generating a personalized estimate of an student's cost to attend Wellesley. The recently-updated version provides a breakdown of the cost paid by the family, work-study, and loan estimates, in addition to grant assistance provided by the college. "We got a highly positive response when we released the cost estimator last year, and with the provision of more detailed information, we hope to continue and expand on that," said Wellesley economics professor Phillip B. Levine, who invented My inTuition. Levine says the new detailed breakdown provided by the tool may help alleviate some of the concerns around student debt. "Many families worry that their children will need to take out tens of thousands in loans to cover what they aren't paying out of pocket,” he said. “My inTuition helps them understand that is not the case at Wellesley." The Department of Education calculator is especially helpful for students trying to narrow their school choices to private non-profit, private for-profit or a state-supported college or university. For example, when searching for the lowest tuition, it shows the average tuition of the lowest state-supported public colleges is $7,407 per academic year. But among the lowest-cost for-profit schools, the average tuition is more than $15,000. Students, parents, and public policymakers who are alarmed at the skyrocketing costs of college tuition are beginning to look a little closer at how colleges spend all that money. Is it possible that spending a little less here and there might help rein in rising costs? Illinois legislators think so. Earlier this month an investigative report by the Illinois Senate Democratic Caucus highlighted a series of lavish perks for top administrators at many of the state's public universities and community colleges. The report found, among other things, one administrator at a public university received a compensation package totaling $887,244. Others received perks like car and driver services, as well as memberships to multiple country clubs and social organizations. The report focused most of its attention on the dramatic increase in size of college administrations, which the report characterizes as “sprawling behemoths.” But a general increase in spending on “upgrades” all across college campuses may highlight part of the problem of institutions out of touch with reality. And Aramark is giving it to them. The company says it has installed “action cooking stations” offering made-to-order, customizable options. Students will use the action stations to create their own omelets, stir fry, pasta, and noodle and burrito bowls. The company says that means custom ingredients and flavors – everything from locally grown produce to a wide variety of spices, seasoning, and flavor profiles. "We have almost 600 world-class chefs – supported by a team of dietitians and nutritionists -- dedicated to creating innovative and healthful culinary experiences for our astute college consumers," said Brent Franks, CEO for Aramark's Education business. "Our goal is to make sure students enjoy restaurant quality dining without ever having to leave campus." You can't blame a service provider for providing what the customer will pay for, but it might not be a coincidence that generations that got through school on pizza and burgers at the student union also paid a lot less tuition. Of course, this hasn't happened overnight. 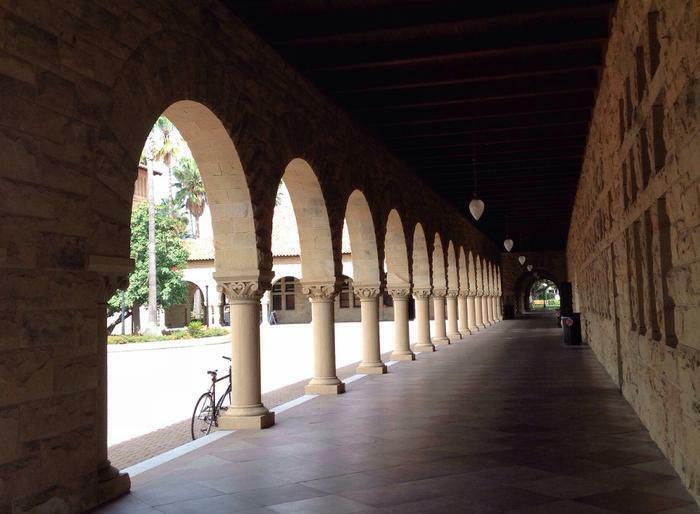 The New York Times noted in 2012 that colleges have been on a long “spending binge” to build the best of everything, with the goal of attracting students who want the best of everything. In the end though, students end up paying for it. According to the College Board, the average tuition, room and board and fees for in-state students at public, 4-year colleges was $18,943 in 2014. Student loan debt is fast approaching $1.3 trillion. Consumers with student loan debt may have a new repayment option under a new Department of Education regulation that recently took effect. The Revised Pay As You Earn (REPAYE) plan will allow 5 million more direct loan borrowers to cap their monthly student loan payment amount at 10% of monthly discretionary income, without regard to when the borrower first obtained the loans. As the name implies, the REPAYE Plan improves upon the original Pay As You Earn Plan, while extending its protections to all student borrowers with direct loans. Besides the monthly payment cap, REPAYE will wipe the ledger clean after 20 years for those who borrowed only for undergraduate study and 25 years for those who borrowed for graduate study. It also provides new protections against ballooning loan balances for borrowers whose income-driven payments can't keep up with accruing interest. But before you rush to sign up, consider this. So, what does this new program mean, exactly, in dollars and “sense?” McClary says it could be substantial for consumers with huge student loan balances, struggling to make ends meet. Discretionary income for this purpose is calculated as the difference between adjusted gross income, taken from the tax return, and 150% of the current poverty line. For this year, that payment would be 10% of what is earned over $17,655 divided by 12 months. Here's an example; a person earning $30,000 a year would see payments capped at a budget-friendly level of about $102.88 a month. Policymakers are concerned that consumers struggling with student loan debt, many of whom are Millennials, are so financially stressed they can't afford other things – in particular, they are having a difficult time buying houses because they can't save for the down payment. This, in turn, is a strong drag on the economy. But what really has policymakers worried is the upward trend in student loan defaults. Those defaults can have a long-lasting impact on a borrower’s financial well-being. A record of late or missed loan payments impacts a borrower’s credit history by making any new loan requests -- for cars or homes -- more expensive or just extremely difficult to qualify for. McClary says borrowers need to proceed with caution. For some, this new payment option might mean the monthly payment doesn't cover both interest and principal payments, which means the balance could keep growing. That makes it harder to get other types of loans, from credit cards to mortgages, because the borrower’s credit capacity is tapped out. Another risk? McClary says the lower monthly payment under REPAYE could lead the borrower to pay substantially more over the life of the loan when compared to a Standard Repayment plan. At last estimate, about 43 million Americans – mostly young – owed student loans totaling more than $1.3 trillion. Paying back that money has strapped many consumers, just at the time they are forming households and should be making key purchases, such as homes and cars. What is important for these borrowers to understand is that they have options when it comes to paying back the money. There is no one-size-fits-all payment plan. To help student loan borrowers understand their range of options, the Consumer Financial Protection Bureau (CFPB) has assembled a Student Loan Payback Playbook, a set of disclosures that can guide borrowers to finding a payment plan that minimizes financial stress. CFPB Director Richard Cordray says millions of borrowers are falling behind on their student loan debts, probably unaware that federal law gives them the right to an affordable payment. Working with Illinois Attorney General Lisa Madigan and others, Cordray says the CFPB developed a way to make sure student loan servicers provide personalized information to each borrower. “This will help these borrowers take action, stay on track, and steer clear of financial distress,” Cordray said. The Department of Education has several repayment plans that afford student loan borrowers with tailor payments that work within their monthly budgets. For example, one plan lets borrowers specify their own payments, based on income. Despite the availability of these repayment options, many borrowers continue to struggle. The CFPB says 25% of student loan borrowers are either behind on their payments or are in default. The agency believes that part of the problem is a lack of awareness among borrowers that they have options. A recent Government Accountability Office (GAO) study found that 70% of direct federal loan borrowers in default had incomes low enough to qualify for reduced monthly payments. The Playbook evolved from work begun last year to reform student loan servicing practices. In particular, the CFPB would like to enlist servicers in the effort to help borrowers understand their options, since there is already an established relationship. The CFPB has taken regulatory action against some companies for alleged illegal student loan servicing practices. This isn't the CFPB's first effort to inform borrowers of their rights. Last year the agency announced its Revised Pay As You Earn (REPAYE) plan to allow five million more direct loan borrowers to cap their monthly student loan payment amount at 10% of monthly discretionary income. The REPAYE Plan was an upgrade of the original Pay As You Earn Plan, while extending its protections to all student borrowers with direct loans. While rising college loan balances remain a cause of concern, there is a bit of good news. The number of students using private loans from commercial financial institutions has declined while the number of those opting for federal loans has risen. A study conducted for the National Center for Education Statistics (NCES) found that private student loans fell by 50% from 2008 to 2012. The distinction is an important one. Private loans are different from federal loans because they're made by banks, credit unions, and other commercial institutions and are not federally guaranteed. They tend to be like other commercial loans, with terms usually based on market conditions and the borrower's credit history. Like other consumer loans, the lenders set the terms and conditions of the loan, usually basing them on the market and the borrower’s credit history. Federal loans generally have terms that are more advantageous to the borrower. According to the research, private loans only accounted for 5% of undergraduates in 2004 but surged to 14% by 2008. It then dropped to 6% in 2012. At the same time, the percentage of students taking out federal loans through the Stafford program increased from 35% to 40% over the same period. It's probably no surprise that private loans dropped sharply after 2008, since the credit crisis hit with full force late that year. Lending standards tightened and banks and financial institutions made fewer loans for any purpose. The study focuses on one possible reason so many consumers are struggling with college loan debt. The proportion of borrowers who took out private loans was highest at private for-profit schools, especially in 2008. These schools tend to be among the most expensive, and some – like Corinthian and ITT – have closed their doors, stranding students with the highest loan balances and the least favorable terms. The Consumer Financial Protection Bureau (CFPB) advises students to always choose a federal loan if possible. It points out that the interest rate on a federal loan is fixed, while the rate on private loans often fluctuates. Sallie Mae, the nation's largest student lender, has agreed to pay $2 million and adopt a new code of conduct on its lending practices, as part of a settlement with New York Attorney General Andrew Cuomo, who has been investigating the often-cozy relationship between lenders and college financial aid officers. Under the agreement, Sallie Mae agreed to discontinue call centers or other staffing for college financial aid offices, discontinue paying financial aid officers for appearing on advisory boards, and discontinue paying for any trips or travel for any financial aid officer. Sallie Mae serves almost 10 million borrowers, manages a portfolio of over $142 billion in loans nationwide, and has relationships with over 5600 schools. "Sallie Mae is the largest student lender in the United Sates. Their adoption of this code of conduct will affect millions of students and thousands of schools around the country, and will help set a new industry standard that all lenders should adopt," Cuomo said. "With Sallie Mae's $2 million contribution to an education fund, thousands of college bound students will now have more information on how to wisely choose the best student loan for them." Congress has taken an interest in Cuomo's investigation. 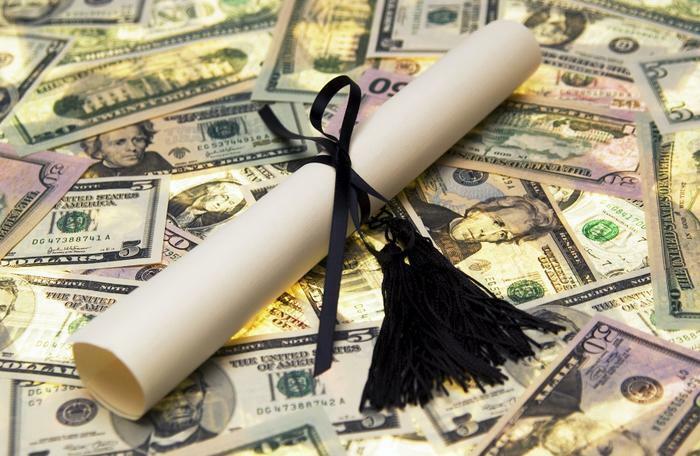 "With today's skyrocketing college costs, it is inexcusable for any financial institution to be collecting excess profits at the expense of students and parents," said U.S. Rep. George Miller, the chairman of the House Education and Labor Committee. "Cuomo's settlement with Sallie Mae demonstrates the value of vigorous oversight, and is an important step towards ensuring that all student lenders abide by the highest ethical standards." Miller said, "The sole purpose of the federal student loan program is to help students pay for college, not to pad corporate profits." Cuomo's nationwide investigation into the student lending industry has uncovered many questionable conflicts of interest including revenue sharing agreements, university call center staffing by lender employees, gifts and trips from lenders to financial aid directors, and even apparent stock tips to financial aid officers. Last week, Cuomo announced landmark multi-million dollar settlements with eight universities and Citibank. In 2006, Sallie Mae and Citibank accounted for 22% of the private loans nationwide. 1. Ban on Financial Ties. Lenders are prohibited from giving anything of value to any college in exchange for any advantage sought by the lender. This severs any inappropriate financial arrangements between lenders and schools and specifically prohibits "revenue sharing" arrangements. 2. Ban on Payments for Preferred Lender Status. Lenders may not pay or give colleges any financial benefits whatsoever to get on a college's preferred lender list. 5. Call-Center and Staffing Prohibition. Lenders must ensure that employees of lenders never identify themselves to students as employees of the colleges. No employee of a lender may ever work in or providing staffing assistance a college financial aid office. 6. Disclosure of Range of Rates and Defaults. Lenders must disclose to any requesting school the range of rates they charge to students at the school, the number of borrowers at each rate at the school, and the lender's historic default rate at the school. This will ensure that schools will have the information they need to select preferred lenders who are best for students and parents. New York Attorney General Andrew M. Cuomo's office has issued a formal notice to Education Finance Partners (EFP) that it will be filing suit over allegedly deceptive practices in the company's student loan business. The suit is the first filed in a nationwide investigation into the college loan industry. Cuomo's investigation has revealed that Education Finance Partners has repeatedly paid schools in exchange for steering loans to EFP and for putting EFP on "preferred lender" lists. 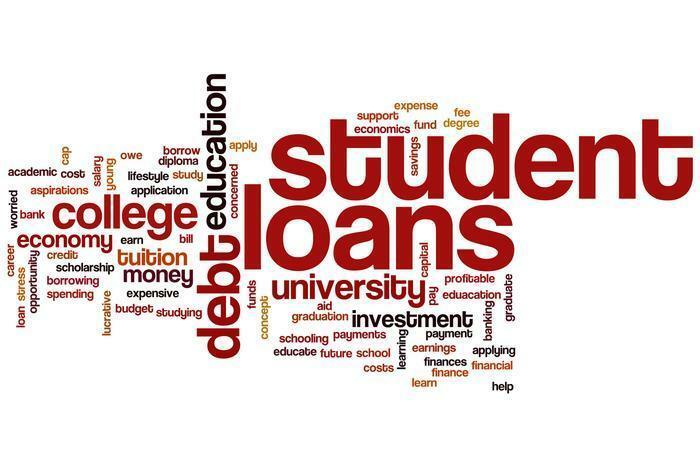 Approximately 90% of students choose their lenders from their school's preferred lender lists. Cuomo said his investigation has uncovered that neither the schools nor EFP adequately disclose to students that EFP is paying the schools to be promoted as a "preferred lender." Cuomo's legal action alleges that the relationship and financial arrangements between EFP and the schools constitute a deceptive business practice. Cuomo also revealed that EFP made its financial kickback arrangements with schools through what are called revenue sharing agreements, which often were based on a tiered system that would give a higher percentage to the schools based on the amount of loans referred. "EFP aggressively offered schools cash kickbacks in exchange for business," Cuomo said. "This kickback scheme was widespread and took place from coast to coast, at colleges large and small, public and private," Cuomo said. "This lawsuit is just the beginning of an investigation that will show that lenders put market share above fair play. "A preferred lender ought to mean that the lender is preferred by students for its low rates, not by schools for its kickbacks. 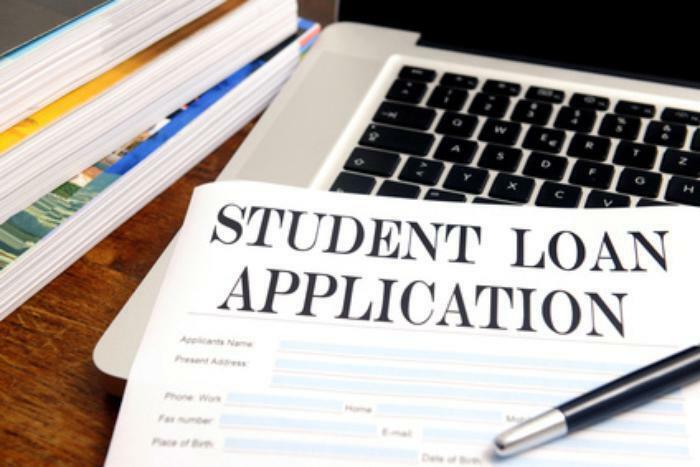 With the cost of college rising every day, the last thing students want to hear is that their lender may be muscling aside a more competitive loan package." This arrangement resulted in potentially large amounts of money paid by EFP to universities participating in the preferred lender program. For example, EFP's agreement with Duquesne University gives the school 60 basis points (.6%) of the net value of all referred loans. The agreements are structured to encourage the schools to refer as much business as possible to EFP. For example, EFP's agreement with Boston University provides that BU will receive 25 basis points (.25 percent) of the net value of referred loans of at least $1,000,000 up to $5,000,000; 50 basis points (.5 percent) of value of referred loans between $5,000,000 and $10,000,000; and 75 basis points (.75 percent) of the net value of referred loans over $10,000,000. Some schools such as Drexel University in Philadelphia received over $100,000 in kickbacks from EFP in a single year. Under Drexel's agreement with EFP, dated April 1, 2006, Drexel has agreed to make EFP its "sole preferred private loan provider." In return, EFP has agreed that Drexel will receive 75 basis points (.75 percent) of the net value of referred loans between $1 and $24,999,999; and 100 basis point (1 percent) of all loan amounts of $25,000,000 or greater. Among the schools with which EFP has had such revenue sharing agreements are: Baylor University, Boston University, Clemson University, Drexel University, Duquesne University, Fordham University, Long Island University, Pepperdine University, St. John's University, Texas Christian University, Washington University in St. Louis, and the University of Mississippi. In total, EFP has had such agreements with more than 60 schools across the nation. EFP engaged further in deceptive marketing practices by using schools' logos, mascots, and names in EFP promotional materials to imply that EFP had the school's official endorsement. "EFP's marketing practices were clearly intended to imply that the universities had endorsed EFP loan products for individual student borrowers," Cuomo said. "Deceptive marketing is just that and it limits the information available for students to get the best deal in their college loans." 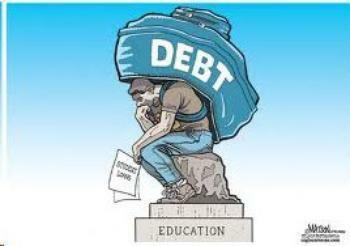 According to the New York State Department of Education, two-thirds of all four year college graduates nationwide now have loan debt, compared with less than one-third of graduates in 1993. In New York State, 59 percent of undergraduates took out loans to finance their college education. 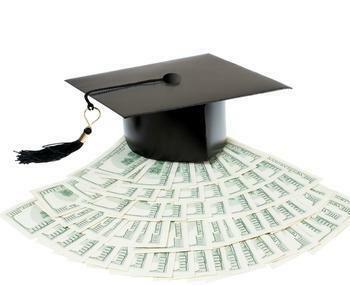 The average student graduating from a four-year college in New York owes $17,594 on graduation day. Cuomo has been leading an ongoing investigation into the $85 billion-per-year student loan industry. In February, he requested information from more than 60 public and private colleges and universities nationwide regarding the standards they use to determine which lending companies are included on their "preferred lender" lists. Financial aid administrators often produce such lists to direct their students toward the lenders that are most preferred by the schools but may not offer the best deals for students and parents. New York Attorney General Andrew M. Cuomo has taken the first legal action against a school in his nationwide student loan investigation. Cuomo announced a notice of intent to sue Drexel University in Pennsylvania over its revenue sharing agreements with Education Finance Partners. Earlier this week, California Attorney General Edmund G. Brown Jr. demanded two California student-loan businesses produce records concerning their financial relationships with public and private universities, and vocational schools in California as part of his ongoing probe into the student-loan industry. In the New York probe, Education Finance Partners (EFP) agreed to Cuomo's College Loan Code of Conduct and will end revenue sharing agreements. Cuomo also announced settlement agreements with three more schools: Salve Regina in Rhode Island, Pace University and the New York Institute of Technology. Salve Regina and Molloy College both had revenue sharing agreements with EFP. Previously, Fordham University, St. John's University, and Long Island University all agreed to cease their revenue sharing agreements with EFP and reimburse students on a pro rata basis for the money received through those agreements. Drexel received over $124,000 from its revenue sharing agreements with EFP and accrued $126,000 more through March 2007 that has not been paid. Under Drexel's agreement with EFP, dated April 1, 2006, the school agreed to make EFP its "sole preferred private loan provider." In return, Drexel was to receive 75 basis points (.75 percent) of the net value of referred loans between $1 and $24,999,999; and 100 basis point (1 percent) of all loan amounts of $25,000,000 or greater. Drexel had an earlier revenue sharing agreement with EFP that began in May of 2005 under which Drexel received 75 basis points (75%) of all referred loans. EFP was a non-exclusive preferred lender under the earlier contract. Since 2005, Drexel University has sent over $16 million in loan volume to EFP. Drexel solicits and corresponds with students from New York, and New York students and their families rely on Drexel's representations about preferred lenders; the New York Attorney General therefore has jurisdiction over Drexel in this matter. "This investigation is a two-front battle: lenders and schools. We have proceeded against lenders and now we are proceeding against schools. There is no reason for a school not to adopt the Code of Conduct," Cuomo said. "This office has been clear to schools: settle or we will commence litigation. Either way we will get justice for students." Salve Regina, Pace University, and NYIT agreed to the Attorney General's Code of Conduct, after the Attorney General's investigation that revealed various practices at each university could have potentially created conflicts of interest. Salve Regina University: Salve Regina University is located in Newport, Rhode Island. The Attorney General's investigation found that during the period of 2005-2006, Salve Regina received over $7,800 pursuant to a form of revenue sharing with EFP, which was one of the Salve Regina's preferred lenders. Between January 2004 and March 2007, certain lenders, some of whom appeared on Salve Regina's preferred lender lists, provided printing costs or services to the university and/or paid for meals and lodging for university employees at loan workshops, conferences, and/or advisory board meetings. Salve Regina agrees to accept the OAG Code of Conduct and will reimburse the affected students $7,839.74. Pace University: Pace University is in Westchester, New York. The Attorney General's investigation found that Pace hired Sallie Mae to staff financial aid call centers, and the Sallie Mae employees wrongfully identified themselves as Pace University employees. Additionally, a Pace administrator who oversaw student loans and advised Pace to drop the federal direct lending program and enter into contracts with Sallie Mae subsequently went to work for Sallie Mae after leaving Pace. This administrator may have had an inappropriate relationship with Sallie Mae while employed by Pace, Cuomo charged. New York Institute of Technology: The New York Institute of Technology has three campuses, two on Long Island in Old Westbury, Central Islip, and one in New York City. The Attorney General's investigation found that NYIT accepted payment from certain lenders, some of whom were on NYIT's preferred lender lists, including payments for sponsorships of University events and scholarships. When composing its preferred lender list, NYIT considered whether or not lenders had made such contributions or offered Opportunity Loan funds as a criterion. Additionally, some preferred lenders including Sallie Mae, Citibank, College Loan Corporation and AFC paid for meals and trips to student loan conferences for financial aid officers. Molloy College: Molloy College is in Rockville Centre, Long Island. The Attorney General's investigation found that Molloy had a revenue sharing agreement with EFP. Molloy received over $1600 from EFP as a result of this arrangement. Molloy has returned this money to EFP and requested that any future revenue due to it under the EFP agreement go towards reducing student loan payments. In the California investigation, Brown is probing Education Finance Partners Inc. of San Francisco and Student Loan Xpress Inc. of San Diego. "Schools and universities in California must be above reproach, and no further burdens should be visited upon students who are already weighed down by escalating student-debt responsibilities," Brown said. The Department of Justice is seeking the information to determine whether the lenders made unlawful payments to schools or university personnel. Brown said he is investigating whether any schools have improperly chosen some lenders in preference to others, and whether unlawful payments have been made to schools from the student lending institutions. New York Attorney General Andrew M. Cuomo has reached agreement with Johns Hopkins University that addresses improper transactions between financial aid officials and student loan companies. This settlement resulted from Cuomos findings that Ellen Frishberg, the director of student financial services at Johns Hopkins University, was improperly promoting a lender, Student Loan Xpress, after the company paid her more than $65,000 in consulting fees and tuition payments. The agreement marks the latest fallout from Cuomos nationwide investigation into conflicts of interest in the $85 billion-a-year student loan industry. Ellen Frishbergs conduct while leading the financial aid office of Johns Hopkins ranks among the worst we have seen at any school across the country. Her work was mired with conflicts of interest, deception, and unethical behavior, said Cuomo. Todays settlement brings to an end a sad chapter in Johns Hopkins history and sets in place a monitoring regimen to ensure this never happens again. Under the terms of the agreement, Johns Hopkins will adopt Cuomos Code of Conduct, and pay $1.125 million. Of the $1.125 million, $562, 500 will be paid into the New York Attorney Generals national education fund. The remaining $562,500 will be used to implement a similar program to be overseen by the Maryland Attorney Generals office. Johns Hopkins has also agreed to have its financial aid procedures monitored for a period of five years by both Attorney General Cuomo and the Maryland Attorney General. The transactions involving Ellen Frishberg, the director of student financial services at Johns Hopkins University, and Student Loan Xpress (SLX), one of the largest student loan companies nationwide, were uncovered as part of Cuomos investigation. Ellen Frishberg accepted more than $65,000 in consulting fees and tuition payments from Student LoanXpress. Frishberg also took payments from other lenders as detailed in the settlement agreement. The transactions took place between 2002 and 2006. During these years, Frishberg failed to disclose these payments and activities, and actively provided marketing promotion and other support for SLX. Cuomos ongoing nationwide probe has exposed, among other things, that lenders pay financial school aid advisors for entertainment, meals, holiday lunches and make office and individual gifts. Lenders have also provided goods, services, or payments to the Universities related to the lending program, including certain office supplies, brochures, information in hard copy and available to students electronically, support for job fairs, workshops for students and employees, awards and promotions, and printing and distribution of brochures. This agreement, together with the recent announcement that Columbia University agreed to adopt Cuomos Code of Conduct, and pay $1.125 million into a national education fund is tremendous progress in achieving solutions to the student lending crisis. Twenty-six schools and the nations top-five lenders (seven lenders in all) have now reached agreements with Cuomo.